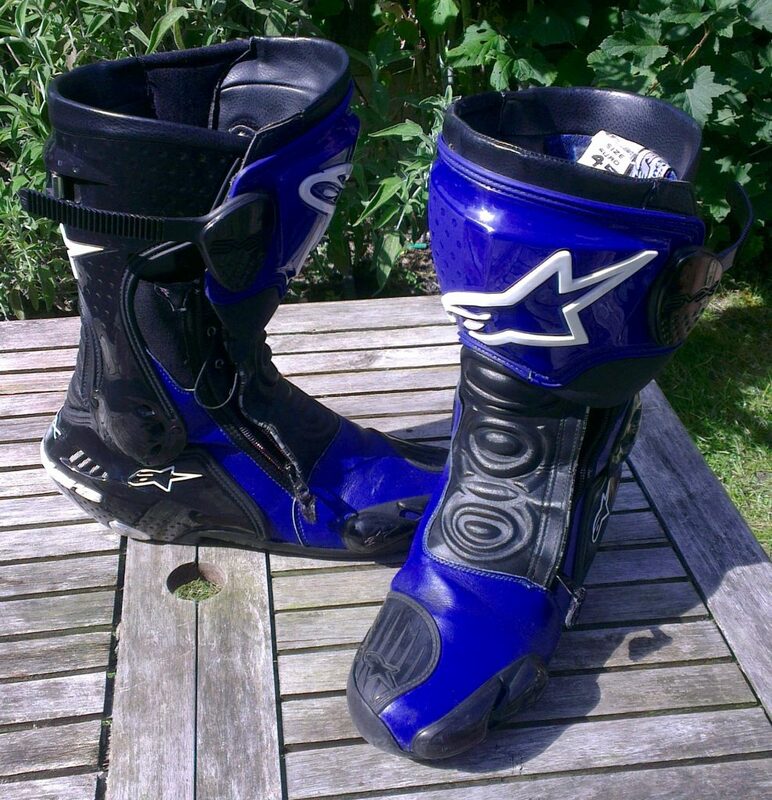 My latest eBay bargain has been these Alpinestars S-MX Plus race boots. Albeit a slightly older model from around 2010, but they’ve been barely worn and came in for the princely sum of £50. A damned sight better than their usual £250 retail price – sorted! They’re a little different from my past S-MX 4 and current S-MX 5 waterproof boots; firstly they’re not waterproof, rather they are nicely vented for cool feet in the summer – which is really works once you’re over about 40-50mph. The fastening are quite different too; internally they have pull cord laces, a zip and a rachet strap too. Definitely no risk of losing these off your feet in a crash. Comfort wise, they’re quite similar to the other S-MX boots, but more chunky and they come up a bit higher on the calf. You notice the extra side protection against the guards above your pegs, sometimes the edge of the protection catches on these too. The heel is also more chunky with protection, though this is only noticeable when you try to put the kick stand down. Fit wise, I’ve got a EU45 (10-10.5 UK), which are just big enough for me whereas I usually go for size 10.5-11 Converse. They’ve turned out to be a great bargain boot for the summer, keeping my feet cooler and stopping me wearing out my other waterproof boots on dry days. Can’t moan at all for the money spent.